The reassuring bromides of "chicken soup for the soul" provide little solace for nurses--and the people they serve--in real-life hospitals, nursing homes, schools of nursing, and other settings. In the minefield of modern health care, there are myriad obstacles to quality patient care--including work overload, inadequate funds for nursing education and research, and poor communication between and within the professions, to name only a few. The seventy RNs whose stories are collected here by the award-winning journalist Suzanne Gordon know that effective advocacy isn't easy. It takes nurses willing to stand up for themselves, their coworkers, their patients, and the public. 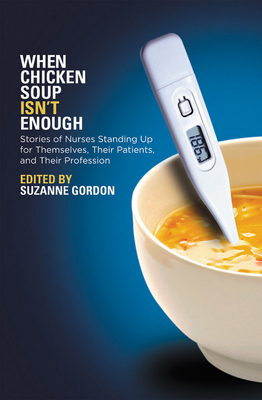 When Chicken Soup Isn't Enough brings together compelling personal narratives from a wide range of nurses from across the globe. The assembled profiles in professional courage provide new insight into the daily challenges that RNs face in North America and abroad--and how they overcome them with skill, ingenuity, persistence, and individual and collective advocacy at work and in the community. In this collection, we meet RNs working at the bedside, providing home care, managing hospital departments, teaching and doing research, lobbying for quality patient care, and campaigning for health care reform. Their stories are funny, sad, deeply moving, inspiring, and always revealing of the different ways that nurses make their voices heard in the service of their profession. The risks and rewards, joys and sorrows, of nursing have rarely been captured in such vivid first-person accounts. Gordon and the authors of the essays contained in this book have much to say about the strengths and shortcomings of health care today--and the role that nurses play as irreplaceable agents of change.